* High-end Fashion Streamline Frame Design. Addmotor HITHOT H7 is the New verson of HITHOT that the integrated streamline bike frame looks so high-end fashion and smooth. * Large Power Motor and Lithium Battery. With its rear hub mounted 750 watt brushless motor and 48 volt 14.5AH lithium ion Samsung battery, the HITHOT H7 has the power and range to accompany you on adventures of almost any length. 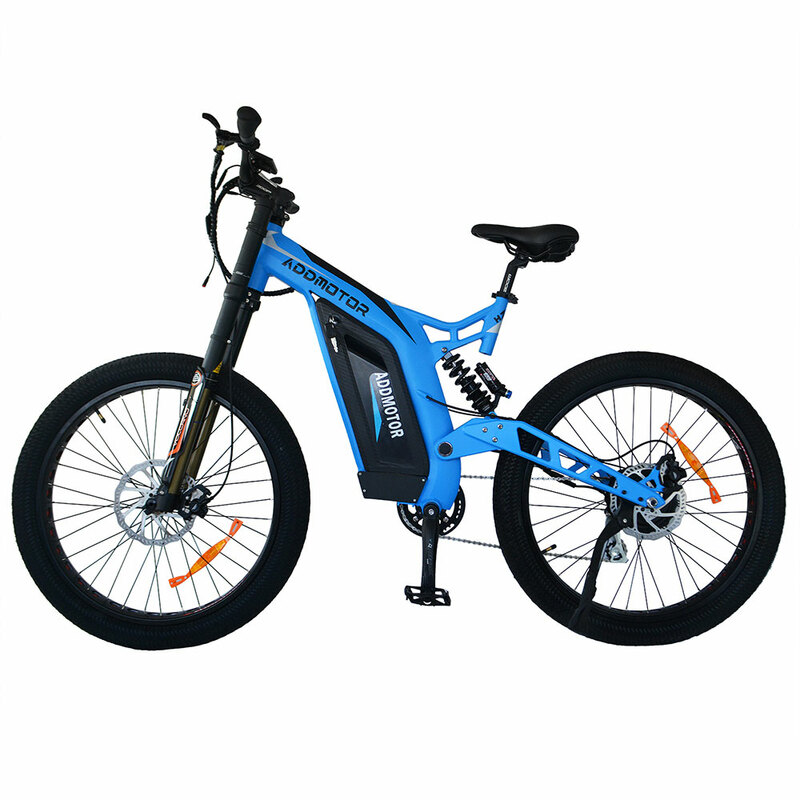 You will never warry about the endurance of the bike like before.With super high speed 750 watts of power motor you can easily reach up to 25 miles per hour with the pedal assistance. * Full Suspension. Featuring a DNM Aluminum 208mm Travel Suspension Fork With Preload and DNM Spring Rear Shock Absorber, HITHOT H7 combines all comfort and pretty good appearance with the dual suspension that make a smooth travel in a rough terrain bicycling. * Use Electric Power or Pedal Assist or Muscle Power to Move Along. The H7 offers three modes of “muscle power”,“electrical pedal assist” or “full electrical operation” to allow you to cruise effortlessly and help you get to a higher top speed,or even climb uphills more easily,also helpful in daily city commute.